Sixteen-year-old East Indian/American violinist Maya Anjali Buchanan studies with Almita Vamos at the Music Institute of Chicago Academy, an elite training program for advanced precollege musicians, and is the recipient of a full-tuition merit scholarship. During the summer season she studies with Paul Kantor at the Aspen Music Festival and School. Maya is a major prize winner in three international competitions. Most recently, she captured the Silver Medal at the 2016 Stradivarius International Violin Competition in Salt Lake City, Utah. In 2015, she was awarded major prizes at the Cooper International Violin Competition in Oberlin, Ohio and the 2015 triennial Johansen International Competition for Young String Players held in Washington, D.C., where she was the only American violinist to be awarded a top prize. Daniel Hathaway of clevelandclassical.com described her performance of the Tchaikovsky Violin Concerto as “displaying verve, direction and an excellent sense of musical architecture” and “a haunting tone which contrasted beautifully with color changes”. “Beautifully played” and it “moved my soul”, wrote Glen Dicterow, previous concertmaster of the New York Philharmonic. She has won first prize in many competitions, including the Walgreen’s National Concerto Competition, Luminarts Cultural Foundation Classical Music Competition, Kearney Symphony Orchestra Young Artist Competition, and Dallas Symphonic Festival; and she was the youngest Grand Prize winner in the history of the South Dakota Symphony Orchestra Concerto Competition which culminated in three performances of the Mendelssohn Violin Concerto at Washington Pavilion. She received Second Place at the 2014 Music Teachers National Association (MTNA) Junior String Competition and advanced to the national finals by winning the state and divisional performance competitions for two consecutive years. 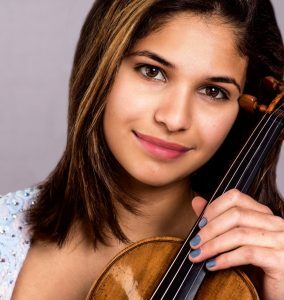 Maya made her solo debut at age ten and has since performed as a guest artist with numerous orchestras, performing works by Bruch, Mendelssohn, Wieniawksi, Tchaikovsky, Waxman, Sarasate, and Vieuxtemps. She has performed at many diverse venues including the King’s Summer Palace in Lyon, France, Aspen’s Harris Hall, Ravinia’s Bennett-Gordon Hall, Chicago’s Symphony Hall and Harris Theater, Chicago Cultural Center, and others throughout Illinois and the midwestern United States. Since age nine, she has participated six summers in the Aspen Music Festival and School (AMFS; 2010-2013, 2015, 2016) and was named the Second Place winner in the 2015 Tchaikovsky Violin Concerto Competition and the 2016 DeLay Fellowship audition at the AMFS. She was one of twelve violinists selected nationally to participate in the solo-intensive Brian Lewis Young Artist Program (2011-2014, 2016). Maya was invited to participate in the biennial 2015 Starling-DeLay Symposium on Violin Studies held at The Juilliard School. She was twice featured in live recorded performances on NPR’s From the Top and was named a 2017 National YoungArts Foundation Winner. In addition to her solo work, Maya is a passionate chamber musician. As violinist of Quartet Degas, she was recently named a top prize winner in the A.N. & Pearl G. Barnett Chamber Music Competition and received the Bronze Medal and audience prize at the 2016 St. Paul National Chamber Music String Quartet Competition. Quartet Degas was also a semifinalist in the 2016 Fischoff National Chamber Music Competition, and Maya was previously a semifinalist in the 2015 Fischoff Competition as the violinist of the Omorfia Piano Trio. She has performed in masterclasses for Ida Kavafian, Pamela Frank, Sylvia Rosenberg, Robert McDuffie, Rachel Barton Pine, Brian Lewis, David Kim, David Updegraff and the late Stephen Clapp. Maya currently performs with a c.1710 Pietro Guarneri violin. Adam Lee, age 16, is currently a student of Hans Jorgen Jensen. He picked up the cello at the age of eight. He is a sophomore at Vernon Hills High School and an active member of the Midwest Young Artists Conservatory’s symphony orchestra. He is also involved in music ensembles associated with that conservatory. 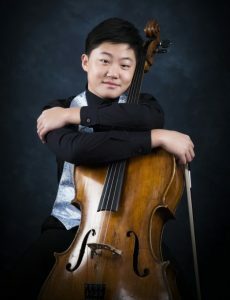 He has attended many competitions and other events, winning prizes from the annual Confucius Competition in 2014, the 2014 International Chicago Music competition, the Society of American Musicians competition in 2015, the annual DePaul Concerto Festival competition in 2016, Honorable Mention at the Walgreens Concerto Competition, and many more. He is also currently the cellist of Quartet Diamante. He and his quartet have won awards at the Discover National Chamber Music Competition in 2016, received first place in the Rembrandt Chamber Music Competition in 2016, and WDAV radio’s Chamber Music Competition for Young Artists in 2015. He also participates in the annual chamber-music collaboration with the Midwest Young Artists Conservatory and the Lang Lang Scholars. Other than competitions, Adam enjoys playing for seniors at the local nursing home, and he frequently plays in churches and participates in school-related music activities. Adam has performed for decorated artists in master/performance classes. As of the 2015-2016 season, artists include Annie Fullard from the Cavani String Quartet; Mathias Tacke, the former second violinist of the Vermeer Quartet; Daniel McDonough from the Jupiter String Quartet; Grigory Kalinovsky from the Jacobs School of Music in Indiana University in Bloomington; Shmuel Ashkenasi from the Curtis Institute of Music; Dmitry Kouzov from the University of Illinois at Urbana-Champaign; Rami Solomonow from DePaul University; and Kate Lewis from Illinois State University. Aside from music, Adam likes to spend time with friends, volunteer at various events, and play tennis.